Chaney, rangy and serious, has no plans to leave the ground. Instead, a controller dangles around his neck and the only thing that faces any sort of danger is Genii, an unmanned aerial vehicle with an 18-foot wingspan, the fruition of his thesis project. He designed it, he built it, and for the last year he’s flown it. We’ve already spent the better part of two hours out here with other radio-controlled aircraft enthusiasts, and a little rain and wind isn’t going to stop Chaney and Patrick Gavin, a fellow student on the Genii team, from flying and collecting data. For now, Genii runs on battery power and only size differentiates it from the other hobby aircraft. But this is the last planned test flight before the real one, the one with the liquid hydrogen fuel, the one that has to take place somewhere within restricted airspace, the one in which Gov. Jay Inslee has shown personal interest. The big one. Today’s the day when Genii must heft her biggest payload yet, 22 pounds of ballast representing exactly how much the hydrogen fuel, the plumbing, all of it, will add when Genii takes that big flight. And when she does, it will be the world’s first university-built, liquid hydrogen-fueled, unmanned aerial vehicle (UAV) to fly—done primarily by WSU students. For now, Chaney, Gavin, and a couple of other students are methodically hurrying through pre-flight. Josh Zoellick, an electrical engineering undergrad, vocalizes an inspection checklist as Chaney scrutinizes the craft with eyes and hands. Ryan Brooks, another electrical engineering undergrad, plugs his MacBook Pro into the craft, initializing the process that will collect Genii’s altitude, ground speed, yaw, vertical speed, distance from runway, and just about any other data point the guys can think of. The hardware “brain” the laptop is talking to is housed inside one of those plastic food containers you can buy at any grocery store. It’s kind of strange, seeing a sophisticated craft outfitted with simple, slapdash housing. But such improvisation, and affordability, is why a number of researchers at WSU are taking advantage of the inexpensive, autonomous, and increasingly ubiquitous technology of UAVs. In fact, drones are prized on campus as more than a platform for testing an alternative fuel source. Perhaps more immediate, and more immediately lucrative, is the potential for a farm enabled with UAVs checking for water stress, nutrient levels, and pests—which could become a reality thanks to WSU researchers. Beyond that, many expect UAVs will be used in almost every aspect of twenty-first century life: search and rescue, mail delivery, law enforcement, telecommunications, and wildlife management, to name a few. Perhaps even sooner. Leachman is one of the faculty advisors for a student group that won a U.S. Department of Energy contest to design a “drop-in” hydrogen fueling station. The idea was to create affordable, easily built infrastructure that could be put in any existing gas station, in preparation for the coming hydrogen-fueled vehicle boom. Hydrogen is touted as the solution to our energy-hungry world’s pollution problem, and rightfully so. It’s almost three times more energetic than gasoline, but weighs virtually nothing. Unlike fossil fuels, the only waste product is water. “So things that fly in the sky like rockets and airplanes really want to fly with hydrogen if at all possible,” Leachman says. Before any airliner is powered with the first element, unrestricted airspace must be found for testing. Right now, it looks like a hydrogen-powered Genii will fly at NASA’s Armstrong Flight Research Center in California. Why not just test fly it here, in the middle of Nowhere, Idaho? The reason: the Federal Aviation Administration. Even though you’d have bigger problems from puncturing a gas tank than a hydrogen fuel cell, the Genii group operates under strict regulations from the FAA. It’s the same for every other drone researcher on campus. When interviewed about UAVs, every researcher talked carefully about how they used them or, more importantly, why they were prevented from using them. First and foremost, the FAA is concerned with safety. Singularly focused on safety, to the point where many scientists say the federal body is squelching innovation and limiting research right at the time it’s needed, while the technology is new, untested, and full of potential. Most Americans, however, probably support this caution. According to a recent poll by the Pew Research Center and Smithsonian Magazine, 63 percent of those surveyed did not support personal or commercial drones in U.S. airspace. Yet the same survey found that six out of ten people believed technology would have a positive net impact over the next half century. Leachman says simply that the FAA “has to relax because they’re really holding back innovation,” the type of innovation, he points out, that’s occurring in countries with far more relaxed regulations like Canada. That’s why he knows the FAA’s rules back and forth. Which is why he has kept the student group at arm’s length. “We have to be very careful,” Leachman says. Though he praises the innovative and imaginative work that can come from a student group liberated from a professor, the fact is the FAA wouldn’t allow the drone to fly if he had any real part in its development, he says. That line will only exist for another year or so, when the FAA has said it will release rules allowing for the commercial use of drones. Researchers are skeptical of the federal body making a quick decision. Though the concept of pilotless aircraft is nothing new, drones weren’t in the everyday lexicon even ten years ago. It was around that time the U.S. military and CIA ramped up their use of predatory drones, which quickly became the primary example of a UAV for most Americans. So we can thank American counterterrorism measures for popularizing UAVs. But more importantly, we should thank our cell phones. UAVs have infiltrated the hobbyist market because the technology inside of them has gotten increasingly smaller, lighter, and cheaper. It’s no coincidence that the smartphone in your pocket is more powerful than the building-sized computers from 60 years ago. More directly, we can credit the development in 2005 of a tiny microprocessor called the Arduino by an Italian professor and his graduate students for the UAV boom. Arduino is cheap, less than $30, and easily programmed. In the new “maker” culture, where words like “hack” and “DIY” are bandied about, Arduino is the touchstone technology. Make: and Wired magazines regularly feature projects utilizing Arduino. Everyone from elementary school students learning computer code to artists creating interactive exhibits use it. As do hobbyists building their own drones. And it’s Genii’s “brain,” the little computer that helps manage the sophisticated aircraft. Ten years ago, Chaney and Gavin wouldn’t have been able to build Genii. The hardware and software simply wouldn’t have been available. In 1919, Prosser became home to an experiment. Washington State College obtained 200 acres and set out to turn this parched center of Washington, which gets about eight inches of precipitation all year, into fertile farmland. If the geometric network of paved irrigation creeks and verdant fields emanating away from the station are any clue, the experiment worked. Nowadays, the state college is WSU, the experiment is called the Irrigated Agriculture Research and Extension Center, and it does more than find novel ways to water a desert. The center houses AgWeatherNet, the central nervous system for WSU’s 154 automated weather stations, as well as the Grape Virology and Stone Fruit Physiology programs. It’s also home to the Center for Precision and Automated Agricultural Systems, where Manoj Karkee toils. Karkee’s office is beyond rows of greenhouses, just south of the USDA building, and right at the edge of field upon field. He’s a scientist, and he is preoccupied with how food is produced, but don’t call him a food scientist. He studies production agriculture. More precisely, he’s an engineer. Which gets us to the point of why Karkee brought his wife, Rojee, and son, Roshis, from their native Nepal to this dry spot between Yakima and the Tri-Cities. His work attempts to deal with a simple truth that humans face in the coming century: Our population is booming while the amount of arable land remains static. That is, the old Malthusian equation of humans outgrowing our ability to feed ourselves keeps him gainfully employed. Though he’s not alone, Karkee’s solution is clear: The robots will be farming. Robots, obviously, will do much of the work for us. But they’ll also take us toward solving the water, nutrient, and chemical puzzles. Simply put, farming is an input-output enterprise. If we can reduce what we put in—water, nutrients—while we increase, or at least maintain, what comes out—food—the future may not be as dire as Karkee suggests. Data-driven agriculture will provide a more precise, smarter, and more efficient way of raising our crops. On a quick tour of the Prosser station, you can watch a mechanized arm shake an apple tree, part of the center’s work to crack into Washington’s harvest of 17 billion apples every year, each one handpicked. You can look through the eyes of a machine to judge an apple’s ripeness. Unlike human eyes, which see a spectrum of just 300 nanometers covering visible light, these mechanized eyes see a much wider spectrum, everything from the ultraviolet to the near infrared to even thermal variations. Among other things, with a glance they can determine the sugar content of the apple and call it fit for picking. Work at the center, much of which Karkee is involved in, includes automated hop twining, pruning, pest detection, chemical application, apple crop load estimation, cherry harvesting, and more. If automation is the future of agriculture, then the future of automated agriculture includes drones. In this respect, this summer a few new robots moved to the farm. They’re small, and one is a fixed-wing airplane, the other a quadcopter. They chase birds off grapes, cherries, and blueberries. Scarecrows of the future. Karkee’s hypothesis is the drones will be much cheaper and just as effective as throwing a net over the whole field, which is currently the most effective, and most expensive, way to stop birds from decimating up to 50 percent of a crop. Other measures, like paying someone to chase the birds away or spraying on chemicals, aren’t as effective. Lav Khot and Sindhuja Sankaran are colleagues of Karkee in WSU’s Biological Systems Engineering department. They’re both originally from India, but came to Pullman last year from the University of Florida, where they used drones to count crops and monitor orchard trees for disease. The married couple was excited to come to Washington because “there are a lot more crops to work with,” says Sankaran. Like Karkee, Sankaran specializes in sensors. Her research focuses on trying to find which sensors and cameras work best to distinguish nutrient deficiencies, water stress, and disease on differing varieties of crops. A wall in her office in L.J. Smith Hall is pinned with a large poster of different aerial photos showing what these drones can see. There are images in a montage of red, green, and blue. Others are in near and visible infrared. Like Karkee, they say the goal is not just to increase productivity and efficiency, but also to reduce the resources needed to grow crops. 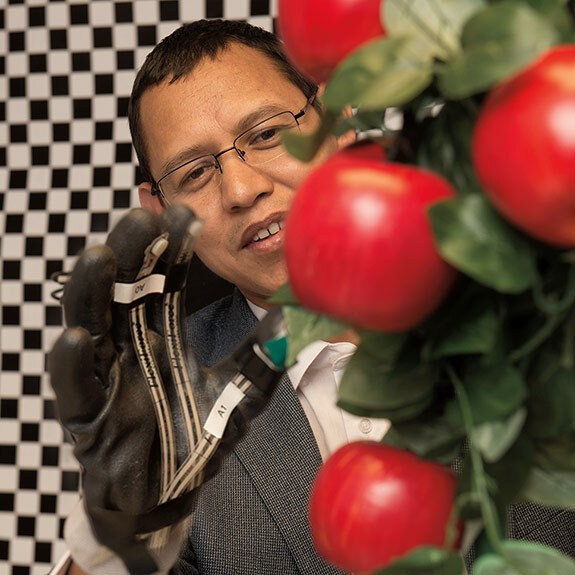 Khot’s latest project, which was recently funded with a $74,000 emerging research issues grant from WSU’s College of Agricultural, Human, and Natural Resource Sciences, looks into using a helicopter-style UAV to remove rainwater from cherries. “If you’re producing cherries for the fresh market, the last four weeks of production are critical. When cherries are ripening, the sugar contained in the fruit is increasing and the skin is getting thinner. If there is rainwater, then the fruit will crack,” Khot says. Currently in sweet cherry production, manned helicopters fly low over a field to blow the rainwater off plant canopies. This is quite expensive and inherently dangerous. While a helicopter can easily cost more than $100,000, a drone can be had for less than $1,000. And if it crashes, no one is hurt. All of this research is exciting, but untried. Like Leachman and his liquid hydrogen-fueled drone, Khot and Sankaran have faced challenges while testing their ideas. They’ve had to pass pilot ground school and each new UAV requires FAA certification. They report to the FAA when they are doing research, at what altitude, how far it is from any airport, what will they do if it crashes, if are there houses around. While arduous, the FAA restrictions are ultimately good for researchers, says Khot. Since commercial enterprises can’t use the technology on their own, they must collaborate with universities. Too late, perhaps. But one way or the other the technology will definitely be lucrative. According to a recent report by the Association for Unmanned Vehicle Systems International, UAVs will have a major economic impact in the United States, much of it in agriculture. While there are many potential uses of UAVs, precision agriculture and public safety are anticipated to comprise 90 percent of their use, according to the report. Washington state is behind only California in predicted economic benefits from drones, which could amount to $82 billion in the decade following 2015. In fact, Washington could see $1.3 billion in economic impact before 2018, and then rake in another $6.5 billion in the seven years after. And it goes beyond uses being tried by Karkee, Sankaran, and Khot, who all readily concede their work is just the beginning. In the near future, a farm could have a small army of UAVs. Each one won’t have a specific purpose. Rather, they’ll be modular and ready to look for disease, chase birds, blow the rainwater off cherries, spray chemicals in a precise location, and tasks no one’s even thought of yet. Their presence will have many ramifications, extending to the role of the farmer. “There’s going to be a lot of data, but how can you make sense of that data?” Khot says. “That’s the challenge. That’s when the next generation workforce will be needed.” In other words, farmers may need to be good at baling hay, but better at crunching data. Beyond the farm, Leachman sees drones working everywhere, from de-icing power lines and knocking icicles off eaves, to bringing you popcorn in Beasley Coliseum after you order it on your smartphone. They may even infiltrate postal delivery. “Eighty percent of the packages are less than five pounds. Imagine if UPS didn’t have to drive around everywhere,” says Leachman. “Everybody says they’re going to blacken the sky. I don’t think they’re going to blacken the sky any more than bees do, to be honest. You might end up seeing them around, and in a lot of ways it’ll be better that you see them around. Such fortitude thrives among the students at Mann Lake, testing the hydrogen-powered Genii. Chaney, the drone’s designer, recently started work at Scaled Composites, Burt Rutan’s company that built SpaceShipOne. That ship, which was financed by former WSU student and Microsoft co-founder Paul Allen, won the $10 million X Prize in 2004 for being the first privately funded, manned aircraft to reach space. Gavin finished his undergrad degree this spring and left for Blue Origin, which is Amazon.com owner Jeff Bezos’ effort to reach space without government assistance. Still, before diplomas were in hand and their jobs began, the two regularly trekked to Mann Lake with Genii. On this spring day, a brief window without rain or wind has opened and the time has finally come for Genii to lift all that ballast. Genii has flown a dozen times without incident, but she’s never lifted such a load. “That’s the biggest danger, the weight of the vehicle,” Chaney says. Gavin grabs Genii’s tail and rolls her down the tarmac as Chaney walks close by, silent and thoughtful, the controller dangling around his neck. They step away from the craft and, without pomp, she barrels down the tarmac, her wheels chattering against the pavement as she builds speed. And just like that, Genii flies. Billed as the smallest consumer available drone, it can be charged via USB cable and has a range of just over 150 feet. This microdrone is currently being used by British forces in Afghanistan, primarily for surveillance. Weighing just three ounces, this vehicle was the first operating small drone, built in 1998. This German built copter is used by WSU researchers to test agricultural sensors. Genii was designed and built primarily by WSU students to test a professor’s research on hydrogen fuel technology. The RMAX debuted in Japan in 1998 for agricultural uses. Still used today, the vehicle can fly for only an hour at a time. A prototype is in Smithsonian and Air Force museums. The full size version can fly almost 600 mph. Described as a “hunter-killer” by a military official, the Reaper can fly almost 300 mph at 50,000 feet. At $220 million per vehicle, this craft is a key part of the U.S. military’s combat and surveillance fleet.